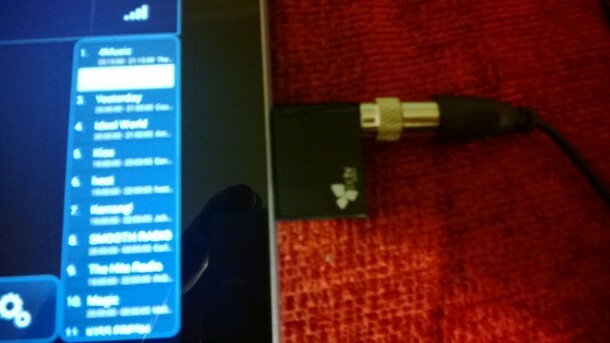 Pinnacle AndroidTV - take anywhere minature TV tuner for your Android Phone or tablet. Designed for use with android Devices with USB on the go and Micro Usb ports the AndroidTV is a real small TV Tuner that plugs into that aforementioned port. It is supplied with a small telescoping aerial which plugs directly in the side, an adaptor to take a coaxial lead and a small desktop aerial that plugs into the coaxial soccer. Software comes for free from the Google Play store and you are automatically prompted to install it when you plug the device in. The UK’s Freeview transmission system is not suited for indoor reception using portable aerials and this device was no exception getting no signal on a first scan. I couldn’t get the telescoping aerial to work even when outside but I dis have more success with the small desktop aerial. Whilst the number of channels was limited and there was some breakup of signal I ddi manage to watch the main terrestrial stations in a way that was reasonable. It certainly would be useful if I was desperate to watch says sporting event covered on one of those channels whilst I was out an about. Plugging in a roof mounted aerial gave the foul channel range (wight he exception of the HD channels) and the quality was really good, Motion was noticeably good with minimal motiion-blur. The software is really easy to use. Once the aerial is connected for the first time it prompts you to scan for channels wit good feedback during the process. Once scanned a list of channels appears and you can choose to sort them into any order you like. The sorting has to be down manually and I would have like a sort by number or name option. 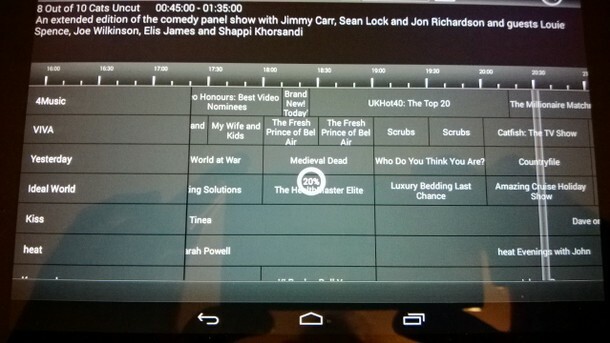 The system uses the over the air guide information to show details of what is showing now and next for each channel and if the information is available to populate the channel guide. Selecting channels to view is simply a matter of tapping on them. Once full screen you can tap on the playing video to bring up a series of options including the option to record. One pain in these options is they didn’t seem to be maintained when changing channels this could be particularly troublesome if you were hard of hearing and needed subtitles - you would have to re-switch these on every time you changed channel. Other than this though the software is pretty user friendly and certainly better than a lot of PC based TV software I’ve seen. It is difficult to fully recommend this unit for UK portable use because the over the air digital signal is really patchy in its quality here but that is not the units fault. I suspect in Europe it would be another matter entirely and i have had reports of crystal clear clarity when used in Germany. Having said that couple this with a 10 inch tablet and plug it into a roof mounted TV Aerial and you would have a really cool TV set for a student or child’s room even if they would have to get some exercise getting up to change the channels which might not be a bad thing.